Simple EBCDIC files with no structure. These can be converted using the Mainframe \ EBCDIC to ASCII filter. 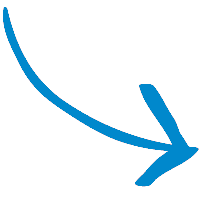 Mainframe CMS Format (variable line length files). Use the Convert \ End of Line Characters filter. Fixed record size with a copybook (e.g. with packed and zoned decimals). Use the Mainframe Copybook filter and simply paste in your copybook. Multi-record format. Use the structure below. 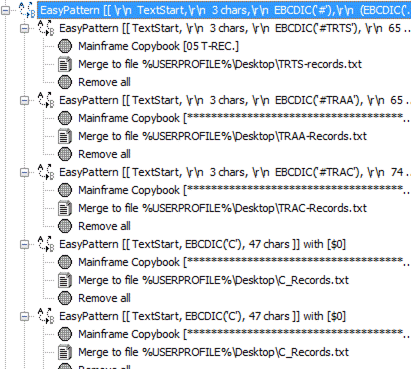 When a Mainframe EBCDIC copybook consists of multiple records, you need to separate them out into a general structure, with each record type going to a new file for clarity and ease of loading/processing. TextPipe makes this easy. The subfilter handles just that record type, and puts each record type in a new file. In our sample file, each record starts with a 3 byte field which we will ignore, followed by a 5 letter record type id, #REC#, #TRAA, #TRAD etc. There is also a field following this record id, but we don't need it, and the value might not always be 'N'. Note: Often, the record type field's VALUES are not included in the copybook, but has to be read from the comments or documentation. In these cases the record type field usually has a constant name like REC-ID. 10 T-REC-LEN PIC S9(4) COMP VALUE 68. 10 T-REC-ID PIC X(5) VALUE '#REC#'. 10 T-REC-STAT PIC X VALUE 'N'. 10 T-TRAA-LEN PIC S9(4) COMP VALUE 69. 10 T-TRAA-ID PIC X(5) VALUE '#TRAA'. 10 T-TRAA-STAT PIC X VALUE 'N'. 10 T-TRAC-LEN PIC S9(4) COMP VALUE 68. 10 T-TRAC-ID PIC X(5) VALUE '#TRAC'. 10 T-TRAC-STAT PIC X VALUE 'N'. 10 T-TRAD-LEN PIC S9(4) COMP VALUE 199. 10 T-TRAD-ID PIC X(5) VALUE '#TRAD'. 10 T-TRAD-STAT PIC X VALUE 'N'. The text is then prevented from continuing in the filter – it stops dead here. Pro Tip: We can easily copy this structure by selecting the top filter, and choosing the [x2] button in the footer. When we paste each copybook fragment into a mainframe copybook filter, we can click the [Show Parse Tree] button to find out the record length. e.g. We also have to grab the record type TRAA from the copybook and put it into the pattern match, and also into the output filename. Then we move onto the next record type. Once we have setup all the record types, we need to gather ALL the record patterns into one MASTER pattern match at the top of the list. ..one line for each record type..
Then you're ready to drag and drop your mainframe file into TextPipe and click [Go] or press [F9]! the copybooks are incorrect. If you are converting a single record type, check that the file type is an exact multiple of the record size from the [Show Parse Tree] option. If you know you have just a single record type, you can use a website to get the prime factors of the file size to work out a likely copybook size. the settings used by the mainframe copybook filter are wrong. Try experimenting with the settings 'Assume adjacent COMP fields are overlapped' and 'Allow COMP-3 to be unsigned' of the most common or initial record type. Unfortunately the copybook does not tell us how exactly the data has been stored. the original data might have been converted to ASCII when it was transferred off the mainframe, and this is the most common problem we see. This leads to corrupted packed decimal values, so always ensure that the file you receive is FTPed off the mainframe in binary mode. Once tested, the TextPipe filter can be run automatically or on a schedule from the command line. It can also be controlled by other software using COM. Need Help With Your Copybook?